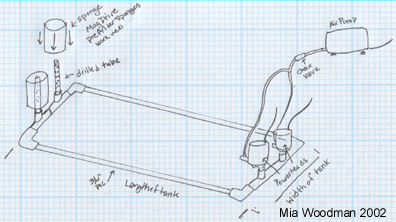 A river tank is a tank having a primarily unidirectional water flow. Intakes for the filtration system are at one end of the tank, and outputs at the other, directing the water down the long side of the tank. Using a tank longer in sideways length and shorter in height is recommended, good sizes being 40 long, 33 long, and 40 breeder. There are several ways of doing this. Plumbing: This way involves using PVC piping, 2 or more sponges, an airpump and 2 or more powerheads to build an undergravel water system. 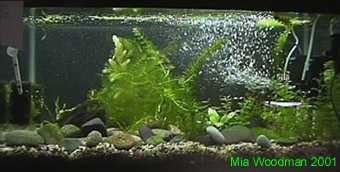 Filter: A modified HOB filter can also be used, though the tank is harder to cover. 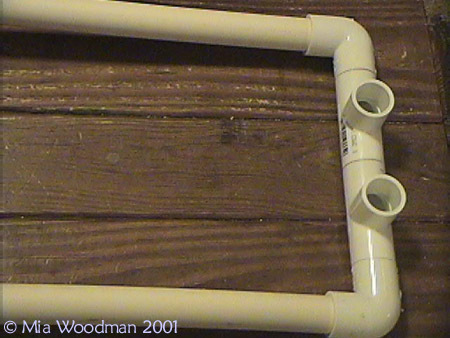 External Plumbing: The third obvious way to make a river tank.is to use PVC piping outside the tank connecting an intake to a pump then to a spraybar. First thing to do is get your tank, heater, gravel, decorations and cover. - Even though this will likely be a cold water tank, a small heater can be used to keep the temp up around 70 degrees, preventing dangerous temp drops. Decorations for river tanks are normally larger rounded rocks and stones, and large pieces of driftwood. Lighting will depend on your preferences, but many put lots of light over river tanks, as many of the inhabitants like algae. For a 40 or 33 long, try to fit 4 4 foot florescent tubes. It isn't prohibitively expensive, and will make it easy to grow coldwater plants and algaes. Connect the PVC as shown above. You do not need any compound to permanently connect it, as it will be underwater, and leaking will not be a concern. Make sure that the powerheads and sponges are not touching the walls. The sponges should be at least an inch away from the far wall. Drill as many holes as you can into two shorter lengths of PVC, that can go inside the sponges. The frame sits on the bottom glass of the tank, powerheads in one end, and sponges the other. Pour the rinsed gravel into the tank, covering all the white pipe. The pipe is completely safe, so don't worry about covering it, we are only doing so for aesthetic reasons. Next place your larger rounded river rocks and driftwood where you planned to do so, and fill the tank. Connect the airpump to the powerheads, remembering a check valve and extra tubing. Plug everything in when the tank is full and watch the river effect. Add plants that are good in coldwater - Java Fern, Anacharis, Hornwort, Lemna Minor, and plastics. Place the cover over the tank when done planting, and the lights above that. Plug the lights in, and stare at your tank. Before you add fish, cycle as you would any other tank, as many river dwelling fish do not tolerate Ammonia or Nitrites in any amount. Many also prefer some algae growth, so before getting the true algae grazers manage to grow some, or borrow algae covered rocks from another aquarium.